Finding a good shampoo for natural, highly textured hair has been somewhat of a journey over the past few years. There are co-washes and cleansing conditioners aplenty, but a good, sudsy shampoo that gets up the gunk without leaving your hair feeling stripped and straw-like? Those are hard to come by. The average "sulfate-free" shampoo tends to dry my hair out, and can turn formerly detangled curls into a matted mess on contact. If you follow me on Instagram or read The Mane Objective, then you know how I feel about Be Kekoa's Be Clean Cleansing Conditioner. I'll spare you the click -- it's life in a bottle. Because the cleansing conditioner performed so well, I had lowered expectations of the shampoo. But when I tell you I was all the way wrong... I was ALL the way wrong. Be Clair has plenty of suds for the ladies that love bubbly action, it cleanses without stripping, and has so much slip, it doesn't make sense. I can honestly say I wasn't ready for the slip I experienced. I loved how it didn't make my hair feel dried out, even though it's a clarifying shampoo. As an added bonus, it's color safe (which helps me maintain my red), and contains extracts of burdock root and green tea to help stimulate and strengthen the hair follicle. You can check out Be Clair at www.bekekoa.com. Although I'm a total product junkie, when I find a good product, I hold on to it for dear life. Such is the case for tgin's Moisture Rich Sulfate Free Shampoo. I first encountered tgin's shampoo in November 2013, and I have never been without it in my product stash since. It's not a clarifying shampoo, but it is a super sudsy shampoo that is great for removing product buildup from the hair and scalp. It's enriched with coconut and amla oils to keep the hair moisturized and shiny. And of course, the slip is totally there. What I love about the Moisture Rich Sulfate Free Shampoo is that it's gentle enough for weekly use, if you're the type of person that prefers shampoos to co-washes. Oh, and you can totally pick this up at Target now, since tgin hit the shelves earlier this month! Click here for my full tgin review! When I first tried the Superfruit Renewal Clarifying Cream Shampoo, it was being put to the ultimate test. I had just finished swimming, and my chlorine had completely tangled my hair. I hopped in the shower, armed with the Superfruit Renewal and just enough conditioner to follow-up after cleaning with. I was completely floored when I was able to detangle and cleanse my hair with a clarifying shampoo in one swoop. On top of that, it smelled absolutely heavenly, had a super creamy texture, and helped smooth my frizz. After that experience, I knew Superfruit Renewal was a keeper, and it has been in my arsenal ever since. Click here to check out my review! Ouidad's Superfruit Renewal Clarifying Cream Shampoo can be picked up at Ulta stores nationwide. 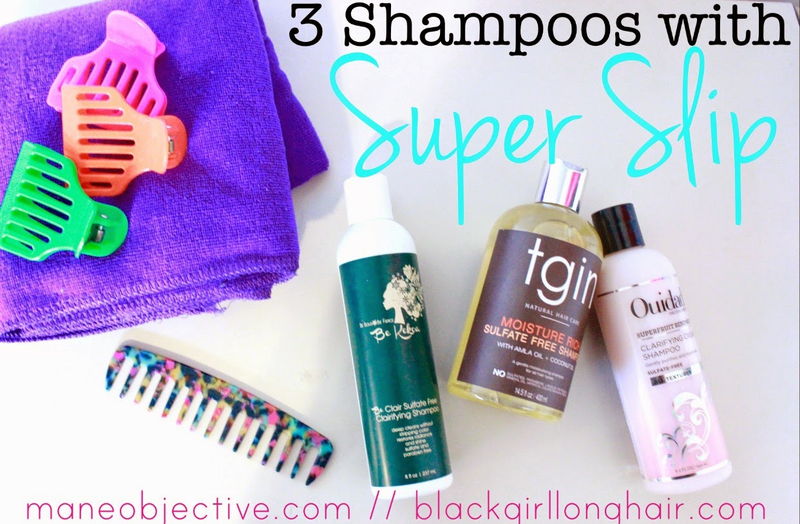 What's your favorite slippery, sudsy shampoo for natural hair?